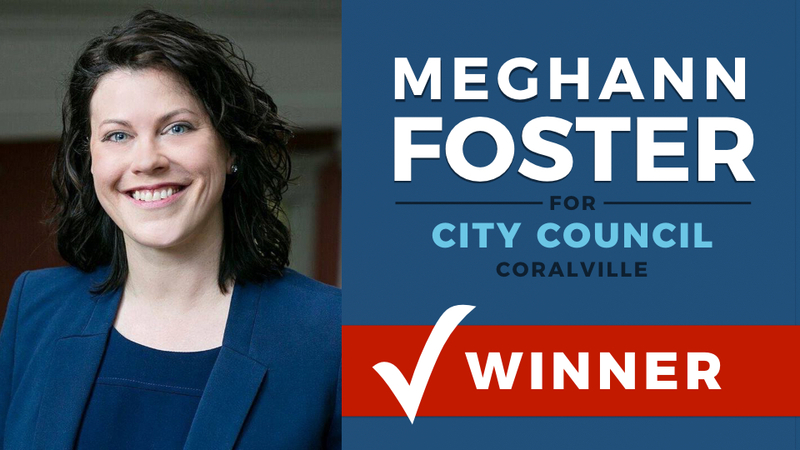 On November 7th, Coralville residents elected Meghann Foster to her first term on the Coralville City Council along with incumbents Tom Gill and Laurie Goodrich. The three join Jill Dodds and Mitch Gross on the five-person council. Mayor John Lundell was re-elected to a third two-year term. 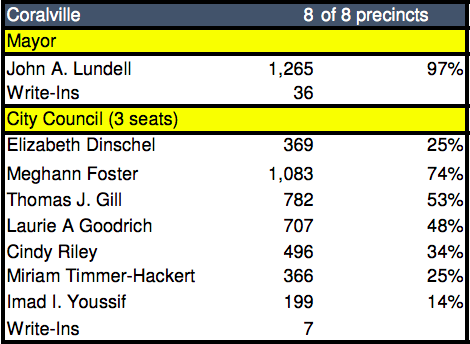 Foster brought in the most votes — 1,083 votes or 74% of all votes — winning in all of Coralville's precincts. She takes the seat left vacant by council member Bill Hoeft, who did not seek another term. Foster's term begins on January 1, 2018. You can view final precinct and summary results from the November 7th election at the Johnson County Auditor's website. On Wednesday, November 1st, Meghann Foster and the other candidates for this fall's Coralville City Council election were invited to a forum hosted by the League of Women Voters of Johnson County, sponsored by the Coralville Community Food Pantry and the Johnson County Affordable Housing Coalition. The event was held at the Coralville Public Library and filmed by Coralvision. You can watch the debate in its entirety above. For more information, check out Meghann's responses to the League's candidate questionnaire. The answers below were submitted by Meghann Foster in response to the League of Women Voters candidate questionnaire. All statements are posted directly by the candidate, unedited by the League of Women Voters and do not express the views of the League. The League never supports or opposes candidates or political parties. The League is hosting a Coralville City Council candidate forum on Wednesday, November 1st at 6:30 PM at the Coralville Public Library. If (re-) elected, what characteristic, or talent, or plan will you bring to the City Council to help with collaboration, communication, and meeting the needs of your constituents? One of my strengths is that I have experience working with a variety of organization types, such as businesses, non-profits, and other community entities through my years of volunteer work in Coralville. As such, I’ve gained a well-rounded view of the strengths and issues facing Coralville, and have developed insight as to how we can build on our success and rise to meet our challenges. This experience, combined with my professional and educational background in communication studies will be an asset to both the council and my constituents. What is the biggest challenge facing the community and how will you address it? Generating sustainable economic growth is an issue I would like to address. Economic development involves more than just creating and attracting revenue for an area. It’s a complex ecosystem that encompasses many things. As such, we need to make sure that our economic development plans benefit the entire community. Jobs that pay a living wage, affordable housing, and community development impact are all things that need to be considered. My focus will be on attracting growing industries that bring high-paying jobs to the area. I also want to make sure that the businesses we attract treat their employees equitably as well. These are the foundational pieces of a strong economy, which in turn leads to a strong community. I am running for the City Council because I love Coralville and serving the community has always been important to me. I’ve lived in Coralville for 16 years and am grateful to be raising my five children in such a vibrant and caring place. When my husband and I first moved to Coralville, we were able to grow our family and put down roots in this community. I want to make sure that other families are able to move to Coralville and grow and thrive the way my family has been able to. If elected, I want to build on our community’s strong foundation and continue to make Coralville a warm and welcoming community for all who live here. I am running for the Coralville City Council because I love my community. I have lived in Coralville for 16 years, and I’m grateful to be raising my five children in such a vibrant and caring place. When my husband and I came to Coralville, we were able to grow our family and put down roots in this community. I want to make sure that other families are able thrive in Coralville the way my family has been able to. My hope is that if I’m elected, I can build on our community’s strong foundation and continue to make Coralville a warm and welcoming community for all who live here. My commitment to Coralville is reflected in my work in the community. I serve on the board of directors of the Coralville Food Pantry and am a frequent volunteer at pantry events. I also serve on the pantry’s communications and fundraising committees. I’ve served as an adviser to the Johnson County Affordable Housing Coalition, and was one of the founding members of the Coralville Affordable Housing Committee. I am an active volunteer with the PTO at Coralville Central Elementary and have been a contributing writer for the Iowa City Moms Blog for four years. I’m also a member of the City of Coralville’s Planning and Zoning commission. Coralville is truly a special place. I’m proud of our community and grateful to call it home. I hope to continue to serve my community on the Coralville City Council. You can also learn more about my campaign and my stance on various issues from my answers to the Gazette Q&A. The answers below originally appeared in The Gazette on October 21, 2017. They were submitted by Meghann Foster in response to the newspaper's candidate questionnaire. 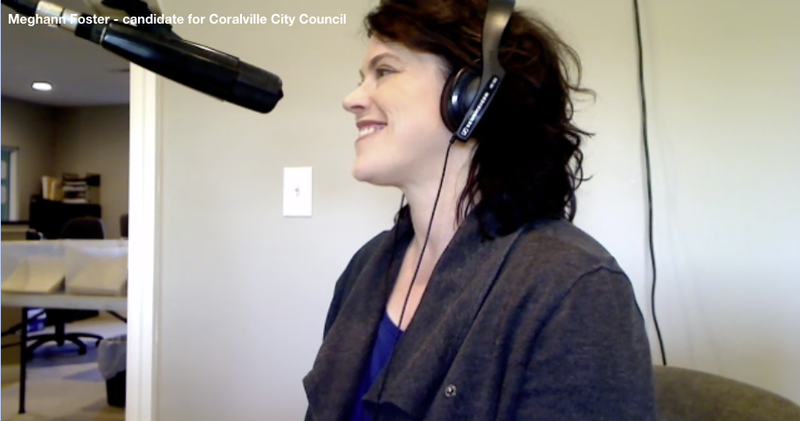 Foster: I am running for the City Council because I love Coralville. I’ve lived in Coralville for 16 years and am grateful to be raising my five children in such a vibrant and caring place. When my husband and I first moved to Coralville, we were able to grow our family and put down roots in this community. I want to make sure that other families are able to come to Coralville and grow and thrive the way my family has been able to. If elected, I want to build on our community’s strong foundation and continue to make Coralville a warm and welcoming community for all who live here. Sustainable Economic Development: Economic development involves more than just creating and attracting revenue for an area. It’s a complex ecosystem that encompasses many things. As such, we need to make sure that our economic development plans benefit the entire community. Jobs that pay a living wage, affordable housing, and community development impact are all things that need to be considered. My focus will be on attracting growing industries that bring high-paying jobs to the area. I also want to make sure that the businesses we attract treat their employees equitably as well. These are the foundational pieces of a strong economy, which in turn leads to a strong community. Innovative Housing Solutions: Safe and stable housing is the bedrock of a healthy community. Many families in Johnson County are housing-cost burdened and Coralville is no exception. Housing is a difficult issue that requires out-of-the-box thinking. I want to find citizen-driven, creative solutions for addressing this issue. Some ideas include partnering with local organizations to renovate and rehabilitate at-risk units, creating a fund to supplement any grant dollars that may be available, and finding ways to stabilize our older neighborhoods without gentrifying them. Responsible Financial Stewardship: There’s no doubt that Coralville has been assertive in their economic development practices. The thriving growth and community amenities we enjoy are the result of many of the investments we’ve made in our community. As we see the results of decades of planning as these projects come to fruition, it’s clear that Coralville has made smart investments. However, as we move forward, we need to pursue other innovative and organic means of generating growth. We also need to find opportunities to pay down our debt quickly. The city has taken several steps in the right direction. I am not in favor of adding new TIF projects until current debt is paid down. If we consider TIF and other similar tools in the future, the projects should be thoroughly vetted for meaningful economic impact at the local level. It’s not in the best interest of our community to use incentives if there’s no clear benefit to the community. Examples of this impact include projects that would generate high-paying jobs and using local vendors and contractors on projects. Next summer, Coralville’s now 20-year-old tax increment finance district for Coral Ridge Mall expires, opening up millions in additional property tax revenue annually. For Coralville, that means about $2 million added each year to the general fund. How would you like to see that money used? Foster: Although there are several projects and/or programs I would like to develop I believe that before we can take on any additional projects and/or programming, we need to be responsible about making sure our city is on solid financial footing. Especially given the state’s budget situation. That’s why I believe that additional dollars in the general fund should be used to pay down existing debt, and/or replace lost backfill funds if the state eliminates the appropriation. The Iowa River Landing continues to grow in Coralville, with housing, storefronts and a soon-to-begin arena project all taking place. However, some have questioned if the area should be offering more affordable housing opportunities. Is this something lacking — or are there other elements missing — in the IRL area? What do you want to see added as development continues? Foster: With all of the growth and development in the Iowa River Landing, it may be hard to remember what the area used to be like. I have lived in the community long enough to remember the Iowa River Landing area before it was developed. It wasn’t just a blighted industrial area, it was also an unsafe place for our citizens with lead in the ground and other environmental hazards that needed to be addressed. The City of Coralville has done great things in the IRL and I am excited for what’s on the horizon. While I do agree that more affordable units would be beneficial in the IRL, we have taken some steps in the right direction by utilizing workforce housing credits for portions of the development and having higher-density residential projects on the horizon. In addition, I would like to make sure that the entire community can enjoy the amenities of the Iowa River Landing. Again, we’ve taken some steps in the right direction here, by partnering with businesses and organizations to offer community events (such as the free horse-drawn carriage rides, movies at Backpocket Brewing, and Winterfest). I would like to see opportunities like this expanded. I also hope that the upcoming Iowa Arena can be utilized for recreation center programming and community events so that as many citizens as possible can access services and enjoy the area. Coralville — and cities across Iowa — could face revenue losses as the state revenues remain tight. The state is threatening to do away with the backfill funds it provides to communities in an effort to balance its budget. How would you balance the city’s budget if the city were to lose funds? What funding priorities do you have? Foster: First and foremost, I hope that the lawmakers in Des Moines do the right thing and continue the appropriation as they had promised to. Discontinuing the backfill could have devastating repercussions not just for Coralville, but for municipalities throughout Iowa. My hope is that if we don’t use the additional revenue to the general fund for debt repayment, we could use those dollars to make up for backfill losses. From our city services to our parks and trails, Coralville offers an exceptional quality of life. Moving forward, I believe our citizens deserve the best services and staffing we can provide. My top funding priorities will include maintaining these areas at current levels and expanding as funding allows. Where do you see growth occurring in the city in coming years? What should the city do to manage it? Foster: We have a lot of new developments on the horizon, such as the Bridgewater subdivision, Scanlon, continued work in the Iowa River Landing, and the Iowa Arena. I want to make sure we are monitoring these projects appropriately to ensure their success, and to make sure they are developing according to our land-use goals and our general community plan. In the years ahead, we need to manage both our current economic development regions such as the Coral Ridge Mall, the Iowa River Landing, and the arena and look ahead to more sustainable efforts in both community development and economic development in high-growth industry verticals and sustainable housing. Future growth depends on diversifying the employers we attract to the area, ensuring innovative and affordable housing options, and building on our comprehensive public transit system. What other big issues would you like to see the council address in the next few years? Foster: The rise in online shopping has caused retail trends to shift. As such, I want to find new and innovative ways to grow our local economy so that we can be sustainable if these shopping trends continue. With the addition of the Iowa Arena, Coralville has the opportunity to become even more of a regional destination for events and hospitality. I want to make sure we are doing what we can to make the arena successful and build on the potential of this new addition. As we grow, we can’t price people out of our community. I’m in favor of the city overseeing innovative projects and facilitating partnerships with developers and other community partners and stakeholders. We have to marry the need for innovative housing solutions with the need to stabilize our older neighborhoods by reinvesting in them. I believe these historic parts of our community are worth protecting and would like to keep them from falling into blight. Safe and stable housing and neighborhoods are the bedrock of a healthy community and a key issue that we need to address with continued focus on public-private partnerships. Again, community development and economic development go hand in hand. I want to work together to ensure that Coralville remains a great place for everyone who calls it home. Meghann is a mom, a small business owner and an educator of strategic communication and social media marketing at the University of Iowa. She is intelligent and hardworking. Meghann is committed to innovative solutions and opportunities for increasing affordable housing, enhancing social services and community and economic development in a fiscally responsible manner. 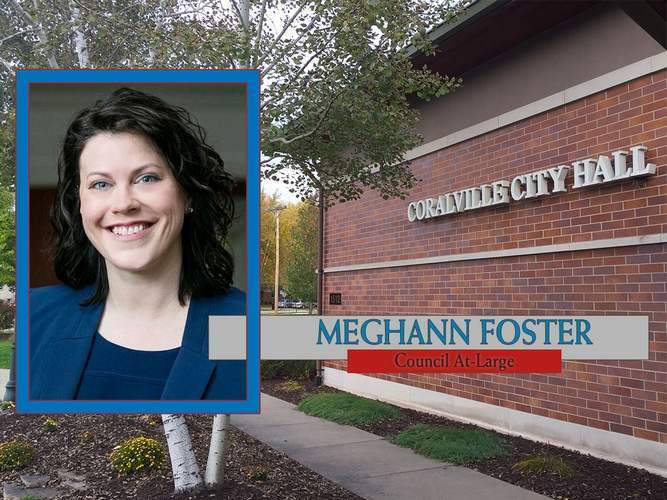 We trust Meghann to keep Coralville moving in the right direction as a wonderful, thriving and vibrant community where all residents have an opportunity to live, learn, work, play, and retire. Please join us in voting for Meghann Foster on November 7th. On Monday, October 16th, Meghann Foster and the other candidates for this fall's Coralville City Council election were invited to a forum hosted by the Iowa City Area Chamber of Commerce, sponsored by the Cedar Rapids/Iowa City Building Trades. The event was held at Coralville City Hall and filmed by Coralvision. You can watch the debate in its entirety above. The next forum will be hosted by The League of Women Voters of Johnson County on Wednesday, November 1st from 6:30 PM–8:00 PM at the Coralville Public Library. On Wednesday, October 18th, Meghann was the morning guest on KCJJ 1630 AM. She discussed her city council campaign and her vision for Coralville including conversation about our volunteer fire department, community development, affordable housing, early voting, and parenting. If you missed the interview, you can watch the livestream video. I'm honored to have received so many letters of support from members of our community. But I wanted to take a moment and spotlight this one by my 17-year old son Harry. 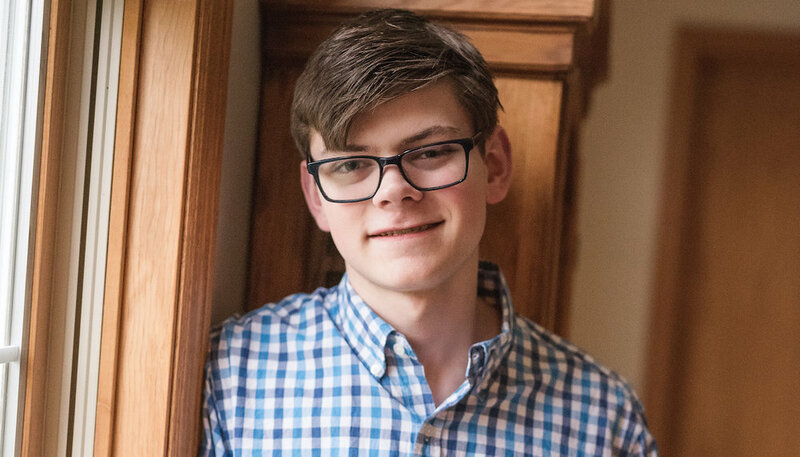 He's a junior at West High, where he serves as a film critic and reporter for the school newspaper, West Side Story. Thank you, Harry! Love – Mom. In the past weeks leading up the election, I have been helping my mom knock doors in Coralville. One of the things I’ve seen firsthand is her hard work and determination. She will go out even if it’s wet and rainy if only to talk to a few more people. The thing that really struck me was the ease with which she communicates with citizens. She doesn’t get lost in political-speak, tossing in senseless terminology that bears little meaning. Nor does she talk down to them and pander. She finds a perfect balance, channeling her love of the city and her love of change into down-to-earth conversations with people who feel the same way. You’re invited! Meet Coralville City Council candidate Meghann Foster at Dave and Lynette Jacoby's home. Join us for wine, cheese, fall treats, and plenty of great conversation.